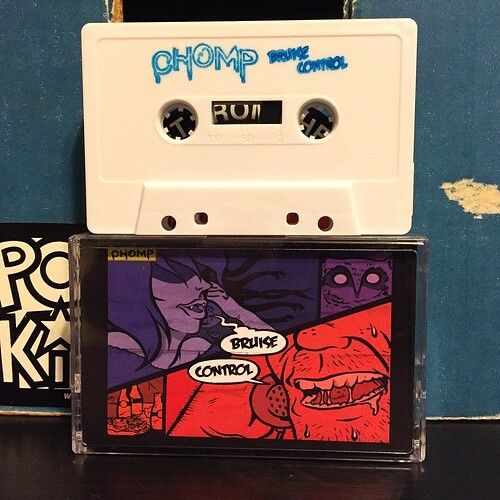 While I was initially bummed that this new Chomp release was only coming out on cassette, I was really excited to hear some new tunes out of these guys. Having been a huge fan of their 2012 Buddha Jabba Mumma I was eager to enjoy some fuzzy and catchy songs. Somewhere between 2012 and the release of this new tape, there have been some big changes in Chomp. The pop has vanished. Where there was once hints of Superchunk and Wavves there is now a bunch of unnecessary yelling. The guitar work is muscular and loud, but the hooks that this band used to cram into every song have also disappeared without a trace. The biggest issue I have with this album is the total lack of singing. Even on the songs where they are not screaming for the entirety, the vocals have this odd talk-sing thing going on. Chomp has somehow gone from a band writing perfect pop songs to one that sounds like that crummy 'punk' band at high school shows that you tend to avoid. Bruise Control is a huge disappointment for me. It's hard to reconcile how this could even be the same band as the one that released Buddha Jabba Mumma. Before listening to this album I figured my review would be full of pleas to put this out on vinyl, but having listened to it I don't think anyone should bother.